PORT ST. LUCIE — Jeurys Familia took a Mets uniform over a chance to pitch the ninth inning. The veteran reliever on Monday indicated he had multiple offers this winter to resume in a closer’s role, but couldn’t decline an opportunity to rejoin the organization in which he grew up and became an All-Star. 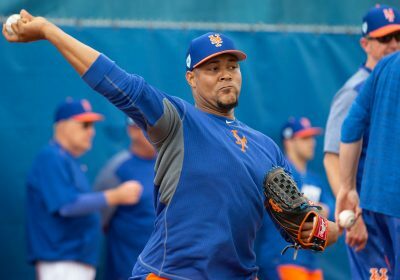 Familia, who will assume a setup role ahead of new closer Edwin Diaz, said he never could have envisioned a return to the Mets when he was dealt to Oakland at last year’s trade deadline. But new general manager Brodie Van Wagenen made a strong pitch to Familia that included visiting with him in the Dominican Republic. Familia, 29, posted a 3.13 ERA and 1.222 WHIP in 70 appearances last season. In addition to Familia, the bullpen added an All-Star closer in Diaz and veteran lefty in Justin Wilson. The lineup additions included Robinson Cano, Jed Lowrie and Wilson Ramos. Van Wagenen’s energy and optimism has helped convince Familia this can be a special club. “If you want to win the game you have to be positive, and that’s the only way we can get to the World Series and win the championship and he has that,” Familia said.